Last week I got to hear the RoomMatch system again—but this time is was hanging in my room right alongside my PA. And boy, wast that fun! Bose brought in the center hang of a three-cluster system we’ve designed so we could easily hear the difference and see how RoomMatch sounds in our room. 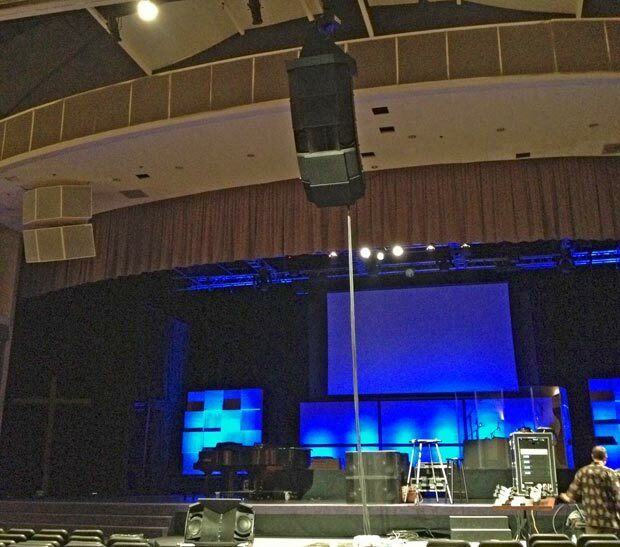 To say the difference was astounding may be an understatement; though to be fair, our system is about as poorly designed as you can get (8 of the twelve speakers are hung so as to be pointing toward walls…). After spending a few hours dialing the system in, we started playing back some of our tracks, then comparing it to what we have now. The difference was clear; our current PA basically creates a huge reverberant sound field, with almost no direct sound, and the RoomMatch creates a clean and clear direct sound field with almost no reverberant field. While music sounded better on RoomMatch, the biggest difference was in the spoken word. One of the things I’m constantly trying to explain to non sound people is the psycho-acoustic principles of how we perceive sounds. I try to find ways to make it easy for them to understand, but sometimes you just have to demonstrate it. So I did. In addition to playing back the recording of our pastor speaking through both PA’s, I also had him come up and try his mic from his preaching position. Our current system has a really nasty 190 msec. bounce-back off the back wall that comes back to the platform almost as loud as the initial sound, which is heard as a distinct echo. And since the PA is actually slightly behind the teaching position, he hears himself say the words, then he hears them out of the PA, then he hears them come back off the back wall, then it comes back again after it’s bounced off the side walls a few times. After we switched him over to the RoomMatch, he said, “Oh yeah, I can hear that. That’s a lot better.” And even before I could point it out, he said, “No wonder I’m so exhausted on Sunday.” Which is exactly correct. When our brain has to filter out all those reflections, it’s like rendering a video in the background on your computer while you’re checking e-mail. The CPU starts working hard, the fan spins up and everything slows down. By putting all the acoustic energy into the seats (which, incidentally is where people sit) and not on the walls, speaking becomes a lot easier. The difference for the audience is significant as well. Rather than trying to filter out all those reflections during the message, you just here his voice—loud and clear—right in front of you. Again, it’s a lot less tiring. And we really don’t want our people to be exhausted after the message—they should be fired up! The thing I think Bose has done better than almost anyone is develop a great pattern control system. When you go out of the patten of the speaker, it really dies off. And because they have 24 boxes to choose from (each with a different horizontal and vertical coverage pattern), they can customize a system to almost any room. I also like that they cross over to the horns a 550 Hz, which keeps the crossover network out of the vocal clarity range. Vocals are super-clean on RoomMatch, both speech and singing. Again, for the church, this is a big deal. Having heard the system in several demos over the last year or so, I continue to be impressed with it. I’ve recommended the system to our leadership, and time will tell if they’re willing to spend the dough on it or not. But one thing is for sure, no one left the demonstration I did for them with any doubt that RoomMatch would be a exponential improvement over our current system. For more on the RoomMatch system, you can read my earlier review of the speakers and amps here and here. Today's post is also brought to you by BargeHeights. Bargeheights offers cost effective lighting and LED video gear for churches. Coupled with unique visual design, Bargeheights transforms worship venues of all sizes.